Mind the Store is a national campaign that works to get major retailers to get toxic chemicals off of their store shelves. Major retailers across the United States sell thousands of products containing toxic chemicals. 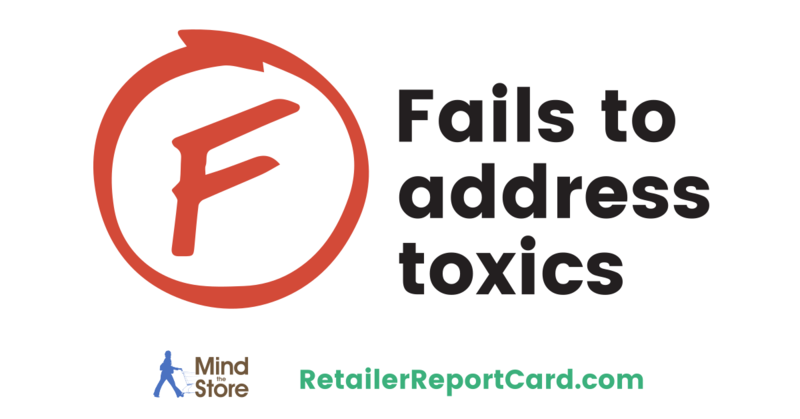 Every year, Mind the Store releases a report card grading some of these retailers towards their progress on getting toxic chemicals off of store shelves. The companies are scored in different areas such as accountability, policy and disclosure. Last year, the Massachusetts-based TJX received an F grade for not implementing significant policy and failure to take any public facing action. In 2018, nothing has changed. This year the company received an overall grade of F again and got a zero on every single scored category. It appears they have made no effort to address these issues. Other companies such as Apple or Target are larger retail chains than TJX and have set a new standard by receiving an overall grade of A for continuous improvement and action. TJX owns four familiar retailers:T.J. Maxx, Marshalls, HomeGoods and Sierra Trading post. Toxic chemicals commonly found in stores include Polyfluoroalkyl substances (PFAS), which can be found in plastic packaging and food serviceware. PFAS are known carcinogens and were originally used to repel oil in clothing, furniture and carpeting. Another commonly found toxic chemical is Bisphenol A (BPA). BPA is a hormone disruptor and causes heart disease, and can be found in receipts and food-can linings. Take Action: Make your own voice heard and tell TJX to stop selling toxic products. If customers tell TJX and other major retailers we care about health and we want safer products, ultimately they will have to listen.